- Sour cream apple pie at Matsunosuke New York - the only other patrons were a mommy/baby group who had biked there - and Bowie was delighted to have the ladies' attention! - Tsutaya T-Site shop is a wonderful boom/CD/Video store campus encompassing three buildings. This place is cool because the cookbook section also has gourmet food ingredients, the travel book section has travel gadgets, etc. It's like Amazon unplugged. Check out Olga's blog for, you guessed it, more details about the bookstores! Mid-day our nap was interrupted by 4 representatives from the town government who wouldn't go away, they kept ringing and ringing the doorbell. They must've known we were there. It turns out they consider Airbnb to be an "illegal hotel" and they wanted to know how we came to be there. They were friendly and respectful and said we could stay but we should know the law is being broken. It's too bad because we love Ebisu and Daikanyama neighborhoods for being quiet and having wonderful boutiques, and being central - but there are just very few hotels in this area. In the evening, we split and went different directions. Olga and Bowie went back to one of the free play areas with crawling space and toys and other kids to play with. 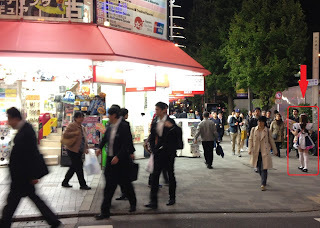 I went out to Akihabara, Shinjuku, and Karaoke. - Young ladies dressed like french maids trying to get pervy men in the maid cages where customers are attended to with a certain level of attention. You can't walk down a block without bumping into a few of these maids. It's neat to see the scene but I couldn't find anything I wanted to take home. Shinjuku seems to be the main downtown Times Square (circa 1990) type of area. Lots of lights and sounds and crowds of drunk people and bars and souvenir shops. At 11pm it was just starting to pick up. It was nice to find a hot spot in Tokyo (after going to bed early with Bowie every night) and stock up on souvenirs at Don Quijote. Headed back to Ebisu. There's an oldies club near our flat called Jan Ken Pon (Rock Paper Scissors) that advertises itself as karaoke where you can sing with a live band. For $20 you can to catch one set, 1 drink, and do some karaoke. When I got there, the band was just going on break, but each band member came over to talk with me and find out how my trip is going, what do I think about Japan, what kind of music I like. They are exclusively a 50s band so we chatted about Carl Perkins, Chuck Berry, Buddy Holly, Bill Haley, ELVIS. Even through a language barrier, you can share a common appreciation for artists. They did a rocking set that concluded with Roll Over Beethoven with a Back to the Future guitar solo...awesome. Afterwards I sang duets of Honey Don't and Don't Let Me Down with the lead singer. What a great last night in Tokyo!! Love the pictures. The garden from Bowie's perspective is lovely! !